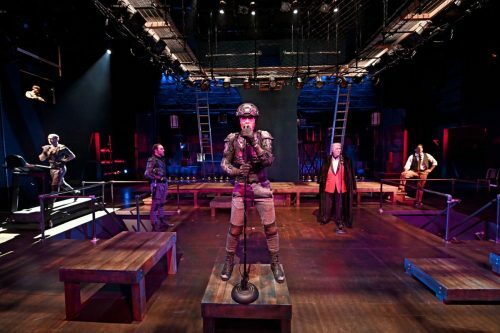 PROVIDENCE — It’s not your grandmother’s “Macbeth.” Rather, Trinity Rep’s production of Shakespeare’s famous tragedy, now onstage through March 3, is a top-notch, new twist on the old “Macbeth,” and a production theater-lovers, Shakespeare fans and students will surely want to see. 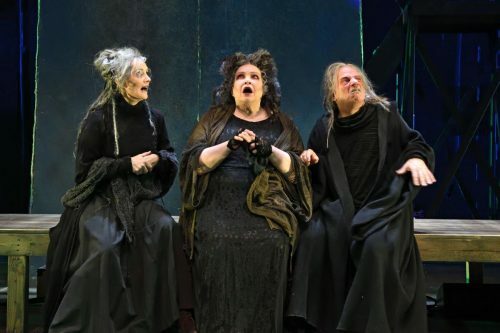 Trinity doesn’t disappoint when it comes to reinventing the classics, and with “Macbeth,” director Curt Columbus (Trinity’s artistic director) proves once again that a modernist approach can be a superlative, satisfying and meaningful one. Joining Berenson’s trio is Janice Duclos as Witch 1 and Jeanine Kane as Witch 3. The three, in their matching black garb and gnarly hair, are as hilarious as they are creepy. Just wait ‘til they start adding the eye of newt and toe of frog to the cauldron, which was actually a vintage white porcelain claw-footed bathtub (full of smoke and spooky people). Yes, there is humor infused in this otherwise horrifying tale of jealousy, ambition and murder. And dismemberment. And beheading. Yes, this is the play featuring “the best of the cutthroats.” Heads will roll. Mauro Hantman tackles the role of Macbeth with an intense ferocity. He’s shaved his head for the part and is quite lean and trim. We first meet him as he pants away while jogging on a treadmill wearing a suit of armor. Speaking of suits, costume designer Andrew Jean has created some exquisite clothing for the cast. Of the many stellar costumes, there is one I can still see clearly in my mind’s eye: it’s when Macbeth and Lady Macbeth (Julia Atwood gives a gripping performance) march around the stage with precision, he wearing a snow white suit and she a stunning, floor-length, blood-red, Grecian-style gown. Such a striking contrast. Atwood, whose eyes widened and spun ever more wildly with each passing scene, is a study in madness. Her sleepwalking, hand-washing scene (“Out, damned spot!”) was excellent. She is superb. Guest artist Alexander Platt was also superb in the role of Macduff and delivered his lines with strength, clarity and veracity. Stephen Thorne, too, gave a good, solid performance as Banquo. Timothy Crowe is an excellent Duncan, and managed to add some levity while wearing his gangster-ish red velvet dinner jacket and white wig. Fred Sullivan Jr., who plays Ross, was, as always, stately and engaging. Rachael Warren plays Captain and Lady Macduff. 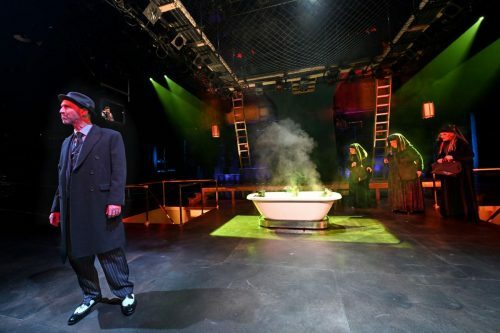 The spare, open set, with its platforms, overhead balcony and drop-down net, works well, thanks to the talents of Michael McGarty, as does the unusual music — which ranges from disco to electronic to hip-hop. Viraj Gandhi, who plays Hecate and the DJ, sits in a DJ box off-stage but very visible and very much a part of the nightclub set. Lighting design is by Oona Curley, sound design by Peter Sasha Hurowitz with magic design by Nate Dendy.